A trip to Dunbar provided me with the chance to reignite my love of Scotch Pies. 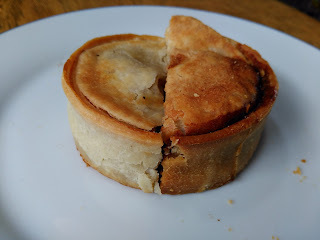 Normally I go on a recommendation by the Scotch Pie club which has meant I have found some very good Scotch Pies. I had no recommendation in this case so I didn't know how high the bar would be set. The simple high street was indicative that this was a small town but it had all the essentials and felt alive, unlike many similar high streets around the country. They are fortunate to have both a Butchery and a Bakery in this scenic seaside town. As is common in this part of the world, both the butchers and the bakers sold Scotch pies. This gave me a chance to do a bit of a head to head. As both cost £1.20 and were about the same size it provided a fair comparison. It was cute to note that the Bakery was run as a community bakery, for the benefit of the community rather than profit. I would have liked them to have had an equally wholesome pie but the Butchers version had the edge in terms of taste. Sadly neither were particularly good, the bar was not set particularly high in this case and they are not challenging near the top of our list of the best Scotch pies. Taking them out of the oven it was amazing to see such a difference in Colour. 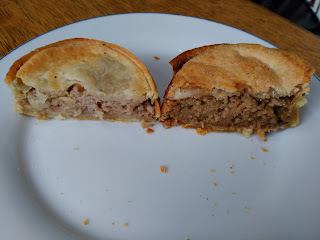 The Bakery pie was a bit on the pale and pasty side wereas the Butchery pie looked had a dark brown, carmalised colour. Strangely this colour variation also applied to the fillings of the pie. Whilst many pies you cannot judge by their appearance, in this case it was a good indication of the taste. The Bakery pie pastry was a bit papery and floury which wasn't helped by a thick pastry base. It did have some crunch to the lid which indicated it had been cooked for long enough. The Butchery pie had crunch pastry with a slight biscuity taste. There was a hint of caramlised sweetness to the pastry which was a bit odd. It was a bit wonky in appearance with some boil out. In both cases, the flavour of the meat was hard to distinguish but given the lower fat content they were certainly not mutton Scotch pies so I assumed that beef was the main ingrediant. The pale pastry of the bakery pie was matched by a pale and rather bland filling. The lack of seasoning left the overall taste mainly coming from the floury taste of the pastry. The butchery pie was well seasoned in comparison but did have a bit of chewy meat. 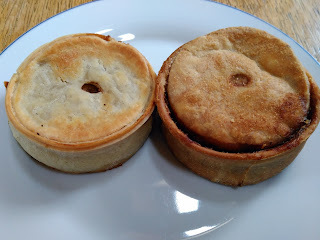 Whilst neither were amazing, they were edible so it wasn't a disaster but I would recommend a trip to Dunbar for the countryside and tourist sights rather than the pies. 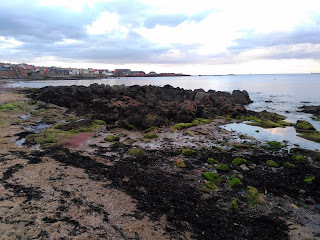 We had a nice cycle from Torness to Edinburgh on National Cycle Route 76 as well as a nice trip on the Borders Railway and a cycle from Galashiels. I didn't manage to pick up any more Scotch pies on the trip but I am sure to be back for more. 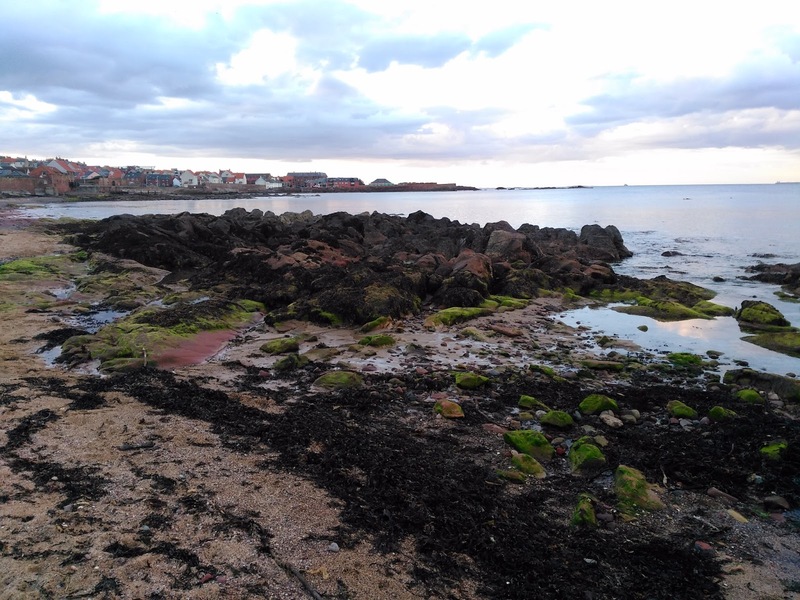 continue reading "Setting the Bar in Dunbar"
As Pierateer RAS has already noted, the price of football pies has gone up above the rate of inflation according to the latest BBC Price of Football Survey. 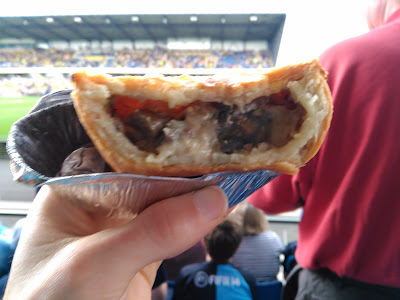 Whilst more than two thirds of ticket prices have been cut or frozen, it seems that clubs are recouping that saving in other areas with prices of traditional match day pies now reaching eye watering (rather than mouth watering) levels. Eight Premier League clubs are now charging £4 or more. For these kind of price in a chippy you would expect to get pie AND chips and still have some change! Yes, the fans can choose not to buy these pies but is it going to kill the tradition of eating a pie in the ground? The pie high prices wouldn't actually be too bad if only the pies were top notch. But at Pierate we have often bemoaned the fact that these pies are regularly not all that good. The challenge of producing a large amount of pies in a short time often leaves them under cooked or dried out. But clubs like Morecambe have shown that table topping pies can be produced without having to charge more (see our Football Pie League). We would advocate boycotting the pies, however we don't want to damage this matchday tradition. Instead, if you think the that your club have #PieHighPrices then why not contact them to let them know?! Together we can raise the standards and not the prices! continue reading "Say No to Pie High Football Prices"
As the 2016 BBC Price of Football Survey launches, indicating that Premier League ticket prices have gone down but pie prices have increased above the rate of inflation, what does this mean for the average football fan? 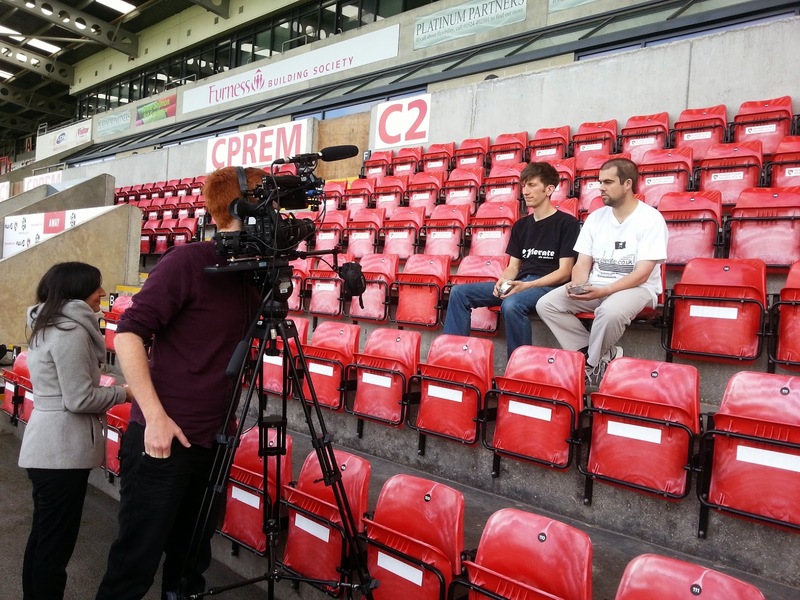 And what should we really be looking for when it comes to the pies of football? But while we realise we haven’t eaten anywhere near enough pies in different football grounds yet – despite having almost 600 pies rated in our Pie Rankings from many of the regular football pie manufacturers like Pukka Pies, Holland’s Pies and Peter’s Pies – we have always been a fan of eating a golden pastry product in the football stadiums we’ve visited. And in our minds what’s more important than simply the price of the pie is how the pie rates. Is it a soggy disappointment, overly dry or lacking in content or does it meet the 7 criteria we Pierateers look for in a pie? One of the pielights of the #PriceOfFootball survey in the main article refers to pies going up in price, despite ticket prices going down! Why should fans have to pay so much for their pies - with many Premier League clubs charging over £4 for a pie - when clubs are on this new £8billion plus TV deal?! In our mind, football fans should never have to pay over the odds for food at a ground, especially their beloved pie! They've already paid for their ticket, so the pies on sale should be good quality and good value! Interestingly the BBC choose to highlight the average price difference between English Premier League pies (£3.49) and Scottish Premiership pies (£2.18) but this is not really a fair comparison. The typical English pie is a steak pie, with full on chunks of meat, where as the typical Scottish football pie would be a Scotch pie, a much cheaper pie to make made of minced meat. In our view, the BBC should only compare like for like pies if they're going to compare at all, and get us to rate the quality - not just the cost!!! As seen in the above video, one football ground has seemingly found the perfect reci-pie for the half time pastry snack, producing some of the highest rated pies on Pierate, let alone best football pies! The secret? Head chef Graham Aimson at Morecambe FC makes his pies on the kitchen on site by hand, rather than just buying them in! Top work Graham and the team! 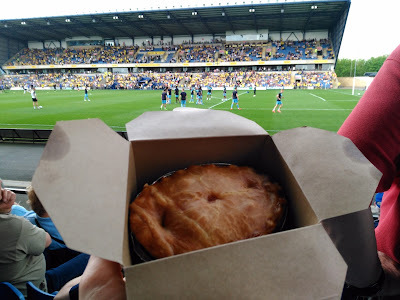 continue reading "The Pies of Football 2016"
At the end of last season our team (Wycombe Wanderers) didn't have a lot to play for but with new pies to review (and the chance to beat local rivals) we headed to Oxford United's Kassam Stadium for the final fixture of the 2015/2016 season. As maybe we should have expected, the game was a disappointment for Wycombe as our form had dipped dramatically during the run in. We lost 3-0 which saw Oxford clinch promotion. Fortunately the pies were anything but disappointing and have performed well in our football pie league. Oxford had gone more up market than most by supplying Chunk pies who we have scored highly before. I picked up a Chicken and Mushroom, while RAS grabbed a Steak and Kidney pie (not reviewed this time). At £3.30 these pies were great value compared to other football grounds. Slightly more expensive than some but worth it for a much more edible pastry package. 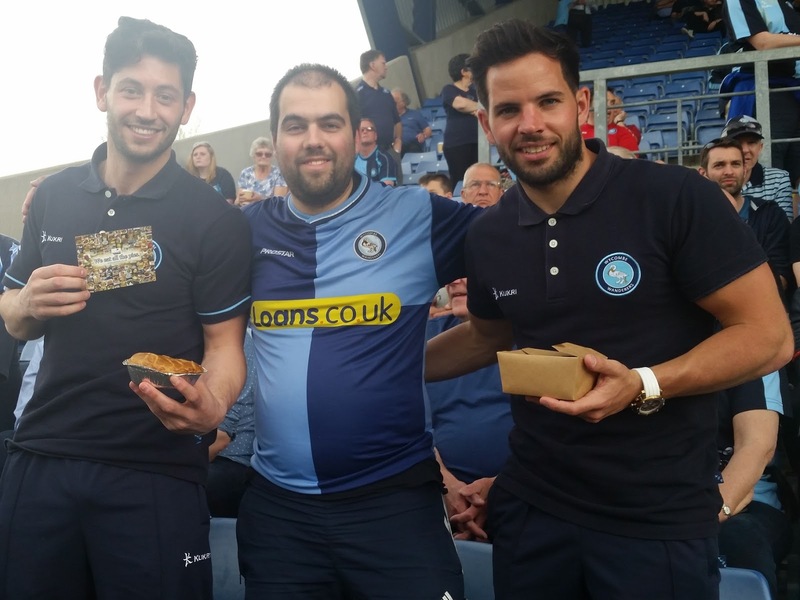 Perhaps the biggest highlight was grabbing a picture with some of the injured Wycombe players holding pies! Sadly they declined to eat them... have they not heard about our research that eating pies can make you lose weight?! The Chicken and Mushroom was not a Chunk pie which I had tried before but I knew what to expect from the Devon company. The shortcrust pastry was very much like you find with a good pasty. In this case it wasn't quite as good as previously. It tasted like it had been microwaved or kept warm for too long. We have often found this problem when catering for so many at a football match but it wasn't too detrimental in this case. The chicken filling was tasty and not overly heavy on the mushroom. The filling went well with the pastry. The amount of filling was good but some air gaps remained. Overall I would certainly have this pie again and wish more football ground would sell pies that are a bit different to the standard dehydrated Pukka pies. The decent pie, bantering with the players and time hanging out with Pierateer RAS in Oxford went some way to making up for the poor display from Wycombe but please can we have some more goals this season lads?! 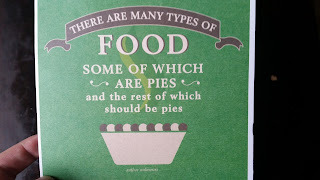 continue reading "Oxford Pie Reviews"
We Pierateers of pie review website www.pierate.co.uk are today celebrating our 7th Birthday, and we'd love you to join us by simply eating a pie and rating it! It follows in the footsteps of the very first International Pierate Day in 2013, which was once again celebrated in 2014 and last year. But we don’t want you – pie lovers worldwide – to just sit at home and watch as we eat all the pies! Oh no! Pie eating and pie rating is something we can all enjoy. Something that can bring friends, family and communities together. 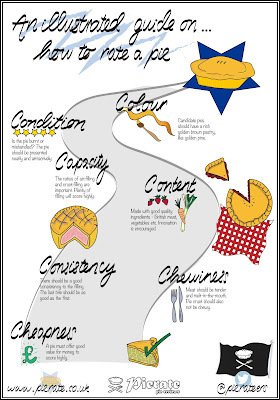 Pies are celebrated and eaten in so many countries worldwide and so today – marking our seventh birthday – we would love you to join us in eating and rating pies this week to celebrate! 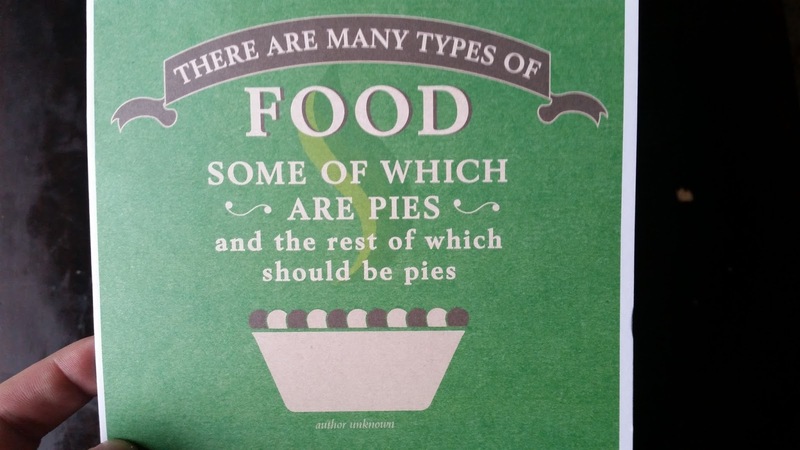 Quite an apt pie card to celebrate our 7th Birthday! This year we got a lovely pie-related Birthday card to celebrate our 7th year, and you may also remember that to celebrate the occasion of our 6th birthday, we commissioned fellow food blogger and amazing illustrator Emily from www.recipesandreviews.co.uk to create us this lovely, personalised print - an illustrated guide on how to rate a pie, based on our 7 Cs of pie rating! 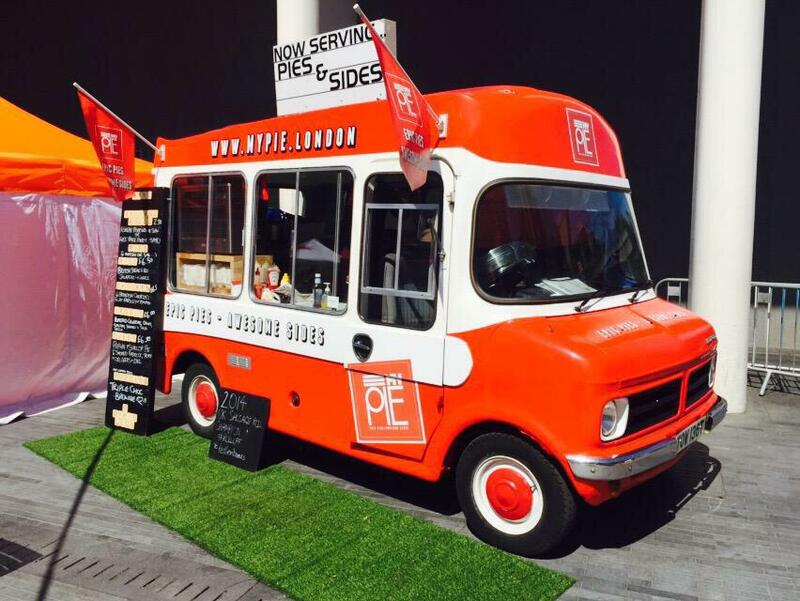 In addition to celebrating #InternationalPierateDay today, we are also delighted to announce that Chris from MyPie London is now our number 1 pie maker on Pierate, taking the top spot since our 6th birthday! Following the closing of Paul's Pies, Chris now holds the number 1 and number 2 spots in our pie rankings! His Steak and Ale pie scoring 6.61/7 has beaten off the com-pie-tition of almost 600 other pies to top our pie rankings! Well, first things first - you need a pie (or two!) For insPIEration you might find our Pie Rankings helpful, with almost 600 pies we've rated and reviewed over the past 7 years! Or perhaps you want to make one of the pies our Ship's Cook has made, following her reci-pies here. Most of all, we hope you enjoy eating and rating pies this week! We sure will and will be rating the pies we ate for our birthday celebrations this week!!! continue reading "International Pierate Day 2016"
To end my Chicago Pie Tour reviews I come at last to First Slice, a pie based charity, who use their profits in order to provide meals to the homeless and needy. This sees them serve close to 4,000 meals a month. In return their customers are provided with tasty food. This arrangement seemed like a great idea to me, a warm pie and hopefully a warm feeling of doing something good! I had never come across anything like it before in all my years of pie reviewing so I felt I had to pay a visit. First Slice have a few cafes in Chicago, unfortunately for me, all were somewhat outside the city centre. I decided to cycle up the Lake front to the Andersonville branch which was a bit of a trek but the journey was nice. After some of the run-down areas I had visited, Andersonville seemed posh. The main high street was bustling with people going to cafes, bars and restaurants. First Slice was down a side street and a little bit more 'shabby chic'. I instantly like it. There was a neon sign advertising 'Coffee & Pie' which is not the way pies are advertised back home (but they should be). Jolly signs outside made clear that this was an establishment which took their pies, and also their charity work, seriously. There was even a giant papier-mache model of a slice of pie. Venturing inside, the guy serving was friendly and keen to chat about Pierate. There were lots of pies on offer although many of them didn't meet our criteria of being fully encased in pastry. This was the sort of thing I had expected from American pies. But yet again there were some fully encased pies. I opted for a classic Apple pie and also a slightly more 'left field' choice in the Balsamic Raspberry & Pear. I was pretty sure that we had never reviewed a Balsamic Raspberry & Pear pie before but it is hard to remember now we are nearly at 600 pie reviews! Both pies were highly enjoyable but were slightly tainted by the fact that I was really, really thirsty after my cycle on what was a hot day in August. I asked a few times for an iced tea and was told it would be brought over to me. It started to get a bit awkward to keep asking for it and eventually I gave up! It was almost like the guy knew I was really thirsty and was doing it on purpose to test my ability to eat a pie while really thirsty! It was surprisingly challenging, I was so keen to drink rather than eat, but nothing gets in the way of me eating pie. Each slice was $3.80, around £3, so I thought this was a decent price for eating in at the cafe (and with the pound being weak against the dollar). The apple pie was absolutely packed with fruit. So much so that it exploded out of the pastry, meaning the presentation wasn't particularly great. It also meant it was a bit short of pastry and actually I was left wanting a bit more to go with my pile of apple slices. But it tasted great with a lovely cinnamon hit and a flavour which was not too sweet. It wasn't all that dissimilar to apple pies back home, with perhaps a bit more cinnamon. Onto the Balsamic Raspberry & Pear. Apparently, it is as the name suggest, a fruit pie with the addition of balsamic vinegar. At first I didn't really notice the vinegar taste but after a few bites I was definitely picking up a bit of vinegar tang. In some ways this worked well, it seemed to complement the sourness of the raspberries. I can't say I noticed the pear, I only realised it had pear when I got back home and looked at my photos! This pie was much nicer in appearance, holding together into an almost perfect slice. Overall, a pie that could have seemed very wrong actually seemed quite right. On leaving the guy at the desk insisted on giving me a slice of Pecan pie to take away as this was the best taste of America in his opinion. I felt a bit uncomfortable taking a freebie from a charity, but it was one of those situations where it was difficult to say no. It was very nice of him. Whilst very tasty, the pecan pie will not be reviewed on these pages because it wasn't fully encased in pastry. I loved my trip to First Slice, what they are doing makes so much sense, I would be much happier going to a not-for-profit cafe back at home if they could serve up good quality food like this and at a price that didn't even cost any more than the other places I visited. It is also a shame that a pie cafe as a concept doesn't exist back home. I guess we normally opt for cake or biscuits to go with our drinks in a cafe in the UK. But it is as I expected, whilst Americans might not share our love of savoury pies, they put us to shame when it comes to sweet pies. continue reading "Last But Not Least...."